I had a different photo in mind for this weeks Living Arrows but this has probably been my favourite from the week so I wanted to share it. 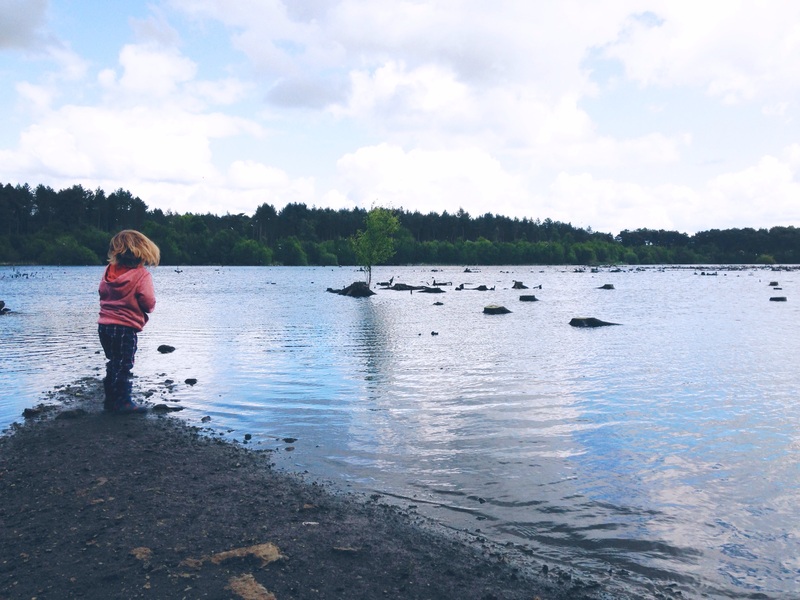 I took it at Delamere Forest which I wrote a little about in Me & Mine. The quote is something I’d found on pinterest as I love pinning all sorts of snippets that I find inspiring and this one seemed perfect to sum up our day out. I’ve always loved getting outdoors with the boys but especially with Lucas. Before the twins came along we would be out together every day, we would walk everywhere and visit the park each morning. He just loved being outdoors and in the summer would be out in the garden before we’d even got him dressed. I guess as he gets older this is changing, he isn’t always quite as eager to just run around outside as he was and he had been having a little grump on his way round the forest, complaining of tired legs and asking for ice cream. However, when we spotted a track leading to the mere he ran off on a grand adventure, eager to explore. He stood right at the end and threw stones in, watching the ripples across the water and each time trying to throw a little further. I’ve always thought that being somewhere outdoors is good for us all, it enriches children in so many ways to let them see the world around them. As he gets older he will be educated in so many different ways. When he starts school this September the emphasis starts on academic achievements. I see my role as his parent to, of course, support that but also to provide the little extras. There is so much more to learn and I want to show him the beauty of nature and to let him explore. I would love to show all my boys things that make them say ‘Wow’, to fire up their imaginations and to bring out new ideas. That is why I love the quote and this photo so much, it is exactly the kind of thing I want to make important in my children’s childhood. I hadn’t been for years so couldn’t really remember it but we had such a fun day I’ll definitely go again! This is beautiful! I love the picture and all you have to say about your precious son! What a lovely moment to capture! Toby loves being outside too, although at the moment if this was him I wouldn’t trust him not to just jump in the water! Haha, yes we’ve been at that stage! Much more relaxing to go out with him now! We struggle sometimes with N wanting to stay inside (or at home – which means out on the farm). Yes that’s outdoors, but it’s so samey, and I don’t want N only knowing the farm and thinking it’s normal to permanently be tied to the farm. Having the farm to explore must be great but I know what you mean, that is just normal for him so nice to go an experience something different. I think as they get older they just need a little more coaxing! Wow, Hayley, it looks like a photo from a ‘Visit England’ campaign. It’s amazing. I’m a big fan of taking the boys outdoors as much as possible. I think it’s good for them. And for me. Way better than being stuck indoors all the time. I also LOVE that quote and of course this beautiful photo. I’m always rambling on about how much I love spending time outdoors, and you’ve captured my thoughts about my role as a parent in showing Lyla all about nature as well. Oh your photos of Lyla outdoors as so beautiful, you can so tell that you feel the same as you both just look like you have so much fun exploring together, I love it! Ah what a fabulous photo, lovely water scene. We love being outdoors too.